I brought a Portuguese white wine over to a friend’s house and it happend to be my dumb luck that he was whipping up a cream cheese omelette for dinner. And he was nice enough to make one for me as well. (Showing up with wine might have had something to do with it, though I’d like to think my good-natured charm played a role.) 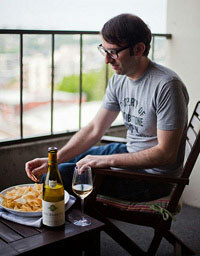 And, like most happy accidents involving wine and food, the two happened to be an excellent match. 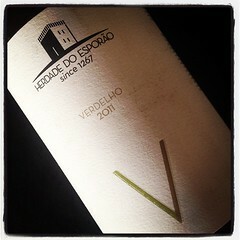 The wine was the 2011 Esporão Verdelho. Though a different grape from the Spanish Verdejo, I find them similar in flavor: both grapes produce the kind of white wine I want to drink right after I walk through the door at home after a long day. Crisp, refreshing, and elegant. And surprisingly good with an omelette (or is it omelet?). Eggs have a great affinity with white wine. And so does asparagus. The sacred cow of a wine rule that asparagus is “difficult” to pair with wine has mystified me. What really surprised me was how effective the Esporão was with the cream cheese. It had enough zip to cut through the richness of the cream cheese, and the tang of the cheese was very complimentary to this lively white. Breakfast for dinner, made even better with wine. Or maybe you’d rather have a Portuguese red wine for a vegetarian pasta recipe? Full disclosure: This wine was a free sample from a marketing company and I will be visiting this winery on a press trip in May. I`m portuguese winemaker at Esporão and I`m responsable for this wine. I couldn`t agree more with you about this affinity, I really love drink Esporão Verdelho with asparagus! So tank you for your post!!!! So great to hear from you and glad to know that there are more people out there who love white wine and asparagus.